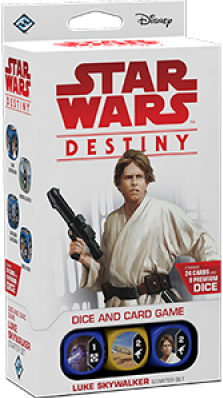 Discover the legacy of two of the galaxies greatest heroes with the Luke Skywalker Starter Set for Star Wars Destiny! The set lets you take control of Luke Skywalker and Han Solo in their battle against the Empire. With twenty-four cards and nine dice, the Luke Skywalker Starter Set contains everything you need to start your journey into Star Wars: Destiny. With powerful abilities, this unlikely pair of heroes is ready to take on whatever challenge comes their way.